The RV shower head is a special type of shower head designed so as to consume a low amount of water and yet deliver a high-water pressure. This is practical, considering that water is a very precious resource in an RV. In addition, you do not have to worry about low water pressure in your RV because this shower head works remarkably well with low water pressure. If you are interested in an RV shower head, we have you covered! Our RV shower head review below will help you find some quality and cost-effective shower heads for the money. The Yoo.Mee has been designed in such a way that it will have no difficulty working with low water pressure. Low water pressure is a common problem in an RV, especially one that is not equipped with a water pump. This RV shower head will have absolutely no difficulty there because it is equipped with a technology called 2XP Turbo Charging. In addition, it has a high flow rate of 2.5 GPM which ensures that it delivers enough water for a clean shower. And when it comes to versatility, no problem there since this model has 3 spray options that are easy to change. Best, you can purchase this model in 2 different colors to suit the color scheme of your RV bathroom. All in all, Yoo.Mee is a top-rated RV shower head for the money, and we have absolutely no problem recommending it. This model by Oxygenics is very popular and even found in some luxury hospitals. The reason for its popularity is because despite being a very simple shower head, it simply works. Indeed, this model has only one spray option and comes equipped with a shutoff valve. However, it has multiple technologies working inside that guarantees that it consumes as little water as possible while delivering a reasonable flow rate of 2.0 GPM. This is quite a feat especially considering that this handheld shower head is quite small. Moreover, this shower head is made from a special material that prevents the buildup of minerals which makes it last a long time. The installation is quite easy by absolute beginners and in this minimalist handheld shower head comes with all installation accessories right out of the box. 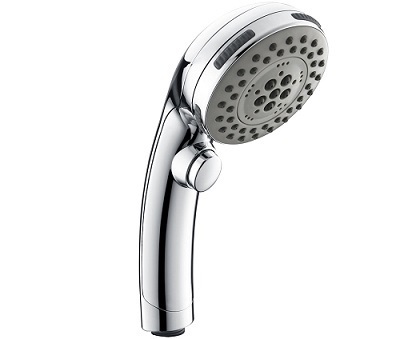 The Camco 43712 is a traditional-looking bathroom shower head. However, this model has been specifically made for the RV because it does not consume a lot of water. But one of the best things about this model is that it is available in a wide range of colors to suit your RV bathroom. You can even purchase it in different styles depending on your need which makes it very versatile. The shutoff valve or on-off switch is located in a strategic position on the handle itself. This allows you to quickly and easily switch the water flow on or off. Moreover, the nozzles of this RV shower head are made from a special rubber that is very easy to clean. In addition, the 5 spray options along with its relatively large shower head of 4 inches will provide you with a great showering experience. All in all, despite its simplistic looks, the Camco 43712 is one of the best RV shower heads that you can currently buy. Even if this RV shower head as a shut-off valve, water will still dribble especially if you have a high-water pressure in your RV. 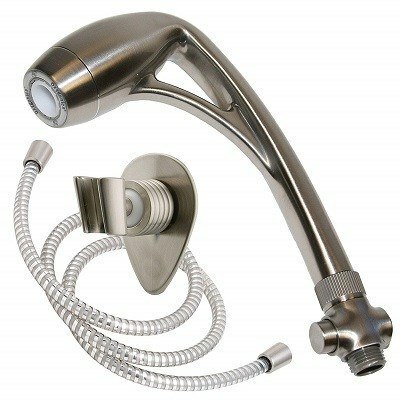 If there is one word that can sum up this PIH RV shower head, then it is definitely affordability. Indeed, this model is unbeatable when it comes to price. However, despite being a budget RV shower head, it still has decent options like a shutoff valve as well as 3 spray options for versatility. The shutoff valve is very easy to actuate, and it will almost completely stop the water from flowing. Additionally, this model comes with all installation accessories delivered right out of the box. Installation is quite straightforward and very easy. The Aqua Elegante has an appropriate name because it actually is quite elegant. This shower head has 6 spray options, so it is very versatile. You can switch between a gentle rain mode, massage mode, water saving, amongst others. Additionally, it has a high flow rate of 2.5 GPM so it would be able to clean your body quickly without consuming too much water. This model is also available in different sizes as well as different colors to match the aesthetics of your RV bathroom. Best of all, there is a removable restrictor in this shower head in case your RV does not have a high enough water pressure. It is incredibly easy to install and that the rubber nozzles are made in such a way that it will not get clogged by minerals from hard water. In essence, it is self-cleaning. But what we like the most about this shower head is that it comes with no less than 5 years warranty from the manufacturer. Rubber nozzles will not get clogged by minerals. Self-cleaning. The Homelody is an absolute winner when it comes to flow rate. Indeed, this is one of the few RV shower heads that has a flow rate of 3.17 GPM which makes it one of the best high-pressure RV shower heads on the market. 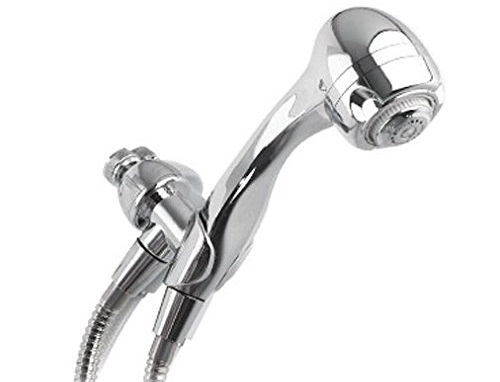 In short, what this means is that this shower head will be able to output a high-water pressure which will allow you to clean your body much faster when compared to other models. It is also very easy to install by absolute beginners, and it uses a tool-free system which is even faster and easier to install. But what really separates this model from the rest of the competition is its impressive 10-year manufacturer warranty. 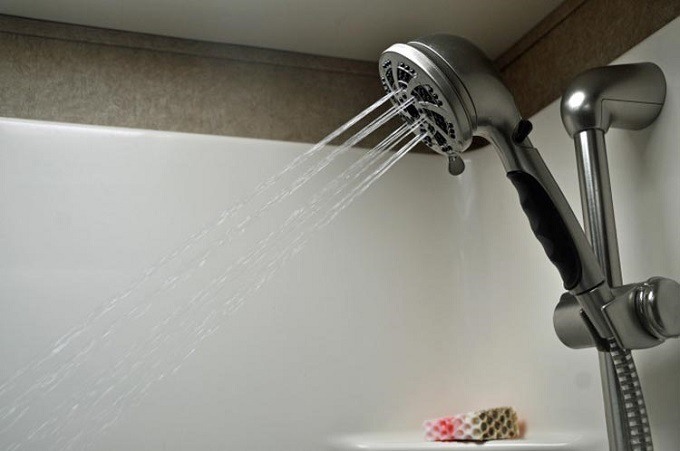 You have absolutely nothing to lose with this RV shower head! What demarks the Dura Faucet from the rest of the models that you will find in this RV shower head review is its simple look. Indeed, this model has only one spray option, but you also get a shutoff valve located to the side of the RV shower head. Moreover, despite this shower head being small and compact, it sports a high flow rate of 2.2 GPM which means that it will be able to clean your body in a quick manner. Best, you have the possibility to purchase this shower head in a wide range of colors to suit the color scheme of your bathroom. If you have never installed a shower head before, then any problem because this model comes with all installation accessories right out of the box. It is incredibly easy to install. 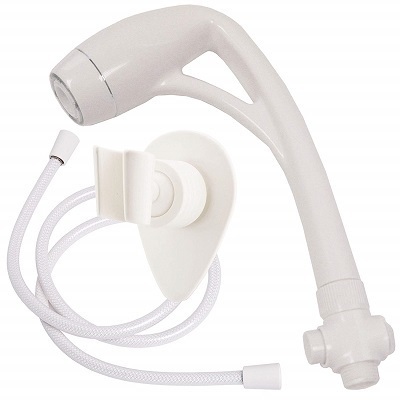 Oxygenics is a popular brand in the shower head industry. This current model by Oxygenics is simple and yet highly effective despite having only one spray option. It also has an excellent build construction with a brass finish that is aesthetically pleasing, durable, and long-lasting. It also has a long and ergonomic handle that is very easy to hold. 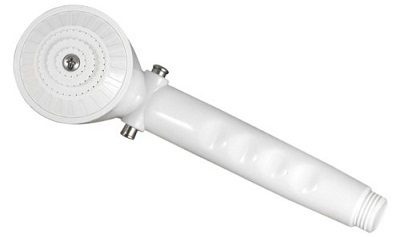 You will have absolutely no problem maneuvering this handheld RV shower head. Additionally, despite its small size, it comes with a high flow rate of 2.0 GPM which matches the compact size of this shower head very well. With such a flow rate, it will not consume an excessive amount of water which will allow you to make some water savings in your RV. You do get a shutoff valve with this purchase as well as a 60 inches hose. As always, installation of this RV shower head is very easy. All things considered, despite having only 1 spray option, this model remains one of the best Oxygenics RV shower head for the money. If you want to save on water in your RV, then there is possibly a no better option than the Oxygenics 88446. Indeed, this model has a flow rate of only 1.75 GPM which means that it will not consume a lot of water. 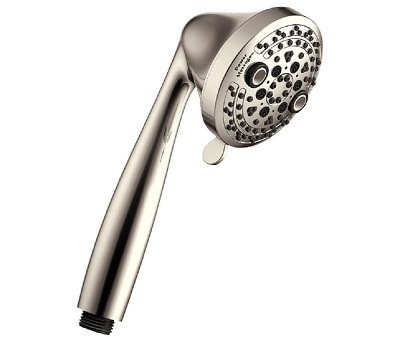 Moreover, it is quite versatile as it has 5 spray option settings just like a regular bathroom shower head. Despite its weak water flow, this model is still able to deliver an excellent showering experience. The handle is ergonomic, and the whole shower head is coated with a brushed nickel finish which is aesthetically pleasing. It uses regular 1/2-inch connections so you will have no problem installing it in your RV. The only caveat we note with this product is that the price could have been a little bit more competitive. But other than this, it is simply perfect! As the most affordable solution in this review, the Phoenix PF276015 is a simple shower head that is easy to use and easy to install. It contains a shutoff valve to the side that will immediately switch off the water flow when pushed. Moreover, this top-rated RV shower head comes only in a white color, and it does not come with a hose so you will need to buy one separately. 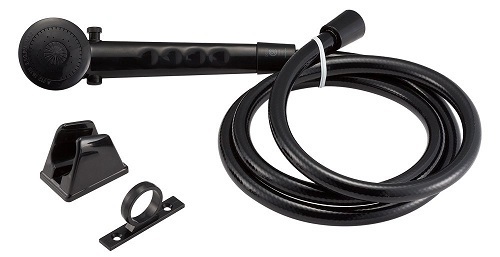 This model uses a regular 1/2-inch connector so you will have no problem connecting it with a bathroom hose. Of course, for the price, there are no additional spray options with this model as it comes in only one option. If you are on a low budget and still need an RV shower head that does not consume a lot of water, this Phoenix model is an excellent choice. The Niagara is made from an ABS plastic that makes it durable and long-lasting. This model has a chrome finish that is aesthetically pleasing and should technically match the color scheme of almost any RV bathroom. One key point is that this shower head comes with all installation accessories out of the box, including wall mounts. But what really separates this RV shower head from the rest of the competition is its low flow rate of 1.5 GPM. This means that this shower head consumes little water which will help you save this precious resource in your RV. If you don’t want to consume a lot of water why showering in your RV, then the Niagara is definitely the best RV shower head and hose that you can buy. The Waterpik is a very popular shower head that you will find in many RVs around the world. This is because this model is simply one of the best that you can buy. It is made from an ABS plastic that is incredibly durable and long-lasting. Moreover, the rubber nozzles are self-cleaning and will prevent the buildup of minerals inside, thus helping to prolong its lifespan. When it comes to versatility, no problem there because this shower head has 5 spray options. It comes with all installation accessories right out-of-the-box, which includes a quality wall mount so that you can use it as a fixed shower head. Best, you even have the option to purchase this model as either a chrome finish or a brushed nickel finish to suit the color scheme of your RV bathroom. Neat! Once you freshly unpacked this RV shower head, the hose may smell. This is likely residue from the manufacturing process. 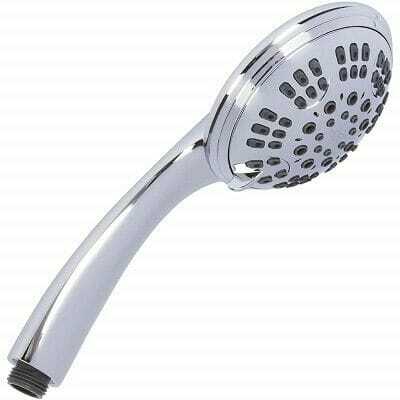 There are several types of RV shower heads on the market. But, the most common one remains the handheld design. Indeed, as its name suggests, with the handheld the design, you simply hold it with your hand and shower. 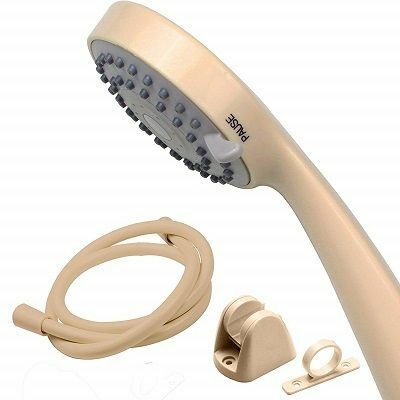 The main advantage of this type of RV shower head is that it is very maneuverable and can reach parts of your body that other types of shower heads cannot. For greater comfort, make sure you choose an RV shower head that has an ergonomic handle. In addition, make sure that the shower head comes with a wall mount because the handheld design is versatile and can also be used as a wall-mounted RV shower head. Water flow is one of the most important aspects of the RV shower head. This value is measured in GPM, or gallons per minute. Evidently, the higher the GPM value of the RV shower head, the higher the water flow. Moreover, the part that will dictate the water flow in the RV shower head is the patterns of the head. It contains tiny rubber nozzles that will guide the flow of the water out of the shower head. Some of the best RV shower heads on the market have maintenance-free rubber nozzles that have been designed in such a way to prevent the buildup of minerals. In addition, there are many RV shower heads that allow you to change the pattern of the water flow for more versatility when showering. A shutoff valve is a special type of valve in an RV shower head that allows you to quickly and easily stop the flow of water with the push of a button. This type of valve is especially helpful if you are lathering and don’t need water running. It will allow you to save water in the long run. 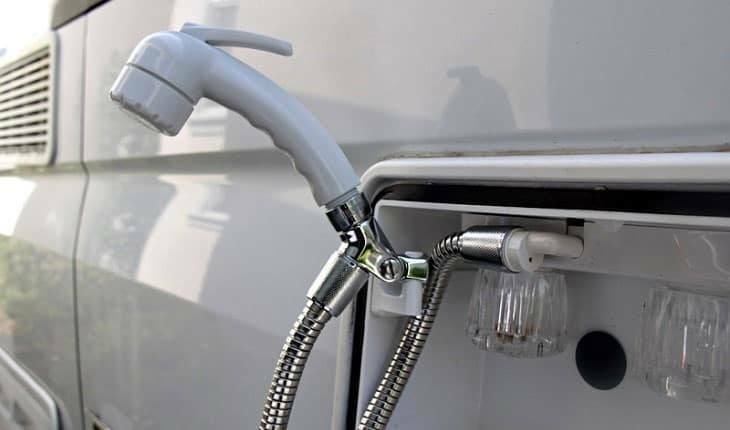 Ensure that your RV shower head is equipped with a shutoff valve and the shut-off valve is easy to reach. Indeed, the position of the shutoff valve is very important because you must not have to look at the valve to turn it off. Having an RV shower head that has an adjustable setting make it more versatile and value for money. One of the most important settings in the RV shower head definitely remains the ability to change the water pattern. Some RV shower heads have multiple patterns, each designed for a particular use. For example, you may want to use a water mist that will help to relax and calm you. When it is time for cleaning, you may want to switch to a high-water pressure mode. Water pressure in an RV shower head is measured in psi. The higher the psi value of the water, the higher the pressure is. By design, most RV shower heads are made in such a way that the output an efficient water pressure of 60 – 80 psi which does not waste water. The RV shower head is one of the most simple and straightforward bathroom accessories to use. Even the installation of the RV shower head is very straightforward. However, if you have never installed one before, make sure that the manufacturer ships their shower heads with an instruction’s manual. Most RV shower heads on the market are made from an ABS plastic. This material is durable and long-lasting and has a somewhat good resistance against shock. 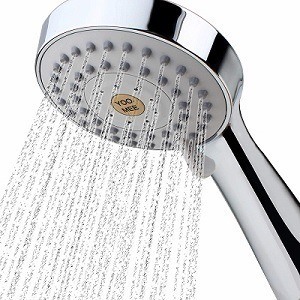 When you are looking for an RV shower head online, make sure you look for terms like “durable, or “ABS.” This will ensure that you get a quality RV shower head for the money. As we have seen, the RV shower head is made in such a way so as to consume very little water and yet delivers a full shower experience. And due to its internal design, it will work even if you have low water pressure. Best, it is affordable and incredibly easy to install. It is also built in such a way so as to prevent water leaks, and most models have self-cleaning nozzles, so they are maintenance-free. 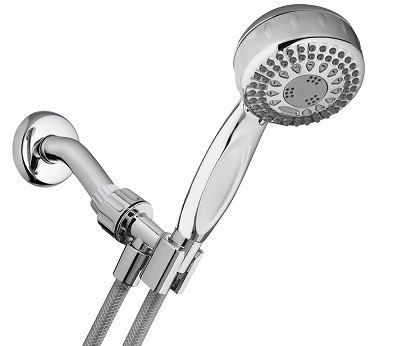 Finally, if you have read our RV shower head review above and still undecided, we recommend you read it again.